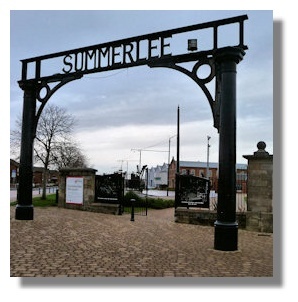 I returned recently to Summerlee Heritage Park in Coatbridge, having had the museum on my "places to visit" list again after writing about it in the "Scottish Snippets" in October 2008 when it reopened after a £10.5 million upgrade. Built on the site of a former ironworks in Coatbridge in North Lanarkshire, the heritage park delights in its reputation as the country's "noisiest museum." It gets its reputation for being noisy because it features large items of working machinery. It has a restored winding engine from the former Cardowan Colliery at Stepps, a 19th century steam locomotive, and working machinery demonstrating how steel and iron were produced, all of which create a great deal of noise. 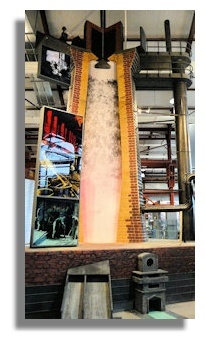 There are many interactive exhibits, many of which make a further contribution to the level of noise in the building. Although it showcases the industrial history of Scotland, there is a particular emphasis on Lanarkshire and Coatbridge - known as the "Iron Burgh" because of the predominance of the industry there. Coatbridge was at the forefront of the production of iron using the hot blast process which made Scotland a world leader in the production of cheap malleable iron which was at the heart of the country's 19th century industrialisation. 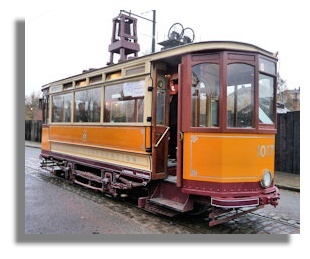 Summerlee Heritage Park has one of only two visible remaining ironworks in the country (dating from the 1830s) and the country's only working electric tram system - though Edinburgh's new tramway system, when it eventually gets built, will challenge the "only" title. The museum we see today was initially opened in 1987 and many attractions have been added since, including a coal mine site and miners' cottages displaying interiors as they looked from 1840 to 1960. Blast furnaces were used by the Chinese in the 5th century BC and in Europe around 1300. The efficiency of the process was further enhanced by the practice of preheating the blast, patented by James Beaumont Neilson from Coatbridge in 1828. Local iron and coal was used as the raw materials and the Monkland canal (and later, local railways) not only carried the raw materials direct to the furnaces but took the output to the growing number of engineering companies and shipbuilding yards in nearby Glasgow. At its peak, the flames from the blast furnaces in the area lit up the sky and made it possible to read at night as well as by day. Working in an ironworks was hard and dangerous and the entrepreneurs who set them up were looking for the maximum return on their investment and paid low wages and were little concerned with the welfare of their workers. A video in Summerlee quotes an iron master regretting the loss of production and profit due to the death of one of the workers in the blast furnace. Iron smelting was set up at Summerlee in 1836 and within a few years there were six blast furnaces on the site. The foundations of the buildings remain visible from a viewing gallery in the museum. Inside there is a spectacular exhibit showing the processes involved to produce the molten iron which would spew out at the foot. The production of iron continued until 1926 when the furnaces had to close down due to the miners' strike that year, and were never restarted. 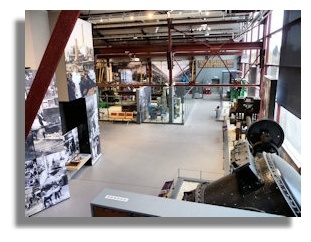 The exhibition hall at Summerlee offers a lot more than blast furnaces, coal mining and engineering. The exhibits serve to educate the many young visitors about what life was like for their parents and grandparents and also allows the older generation to recall their younger years. Going round myself, I was particularly struck by the illustrations of entertainment before the age of TV and computers. 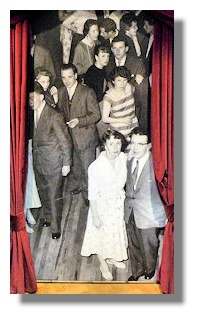 The illustrations of early cinemas in Coatbridge brought back memories of standing in long queues to get in to see the latest Hollywood film and then there were the illustrations of dance halls - where one honed the skills not just of the quick-step and waltz but also how to "chat up" girls! 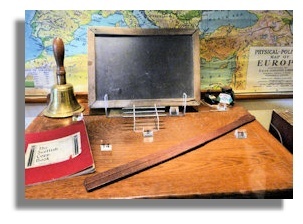 The exhibits of school equipment from 50/60 years ago reminded me of learning to write using a slate and slate pencil. I first went to school towards the end of the Second World War when resources were scarce - writing on re-usable material like a slate which could be wiped clean and reused again and again made a lot of sense. Then again, there was an exhibit of the "tawse" - a thick leather belt which the teacher struck across your hands if you misbehaved! Such corporal punishments have been banned in Scottish schools for many years - the steady increase in bad behaviour in schools ever since may well be related! 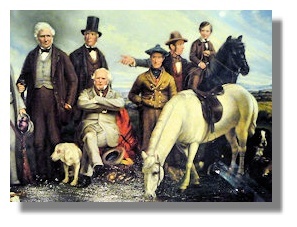 A painting of a wealthy local family from the nearby town of Airdrie, the Rankines, highlighted the gulf between the wealthy landowners and ironmasters and the people who worked for them. Only the rich could afford to have an oil painting commissioned and the Rankines were prominent in the area from the late 18th century. Patrick Rankin was in partnership in an ironworks and his son became provost (roughly equivalent to mayor) in Airdrie from 1848 to 1856. There is a stark contrast between the Rankines and the people who lived in the miners' cottages on the Summerlee site. One row of the surviving buildings dates from the 1840s and the cottages have been furnished as they would have been in those days or soon after. These early dwellings had just one room with two beds fitted along one wall - one bed for the parents and another for all the children. 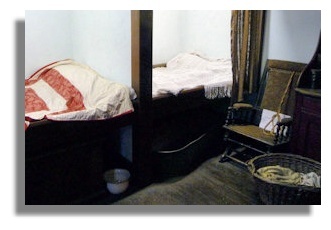 There could be an "overflow" bedspace if required provided with drawers beneath the beds. Lighting was provided by paraffin lamps though the cottage illustrating the 1880s had the latest modern convenience of gas lighting. There was no running water (a bowl beneath the bed sufficed as a toilet) and the cottages were heated by an open fire, which not only provided heat but was also where the cooking was done. Washing of clothes was done in a communal wash house and baths were taken in front of the fire - the father got to use it first and the children in turn then used the same water. A row of houses built opposite at a later date had the luxury of two rooms and these were shown with furnishings of the 1940s and 1960s. 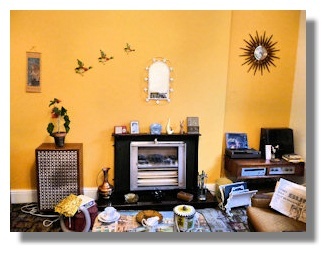 I recognised many of the typical items in those rooms - my parents had the "three flying ducks" on the wall and I had a record player with huge (mono) speakers. To add to the atmosphere, the 1940s cottage had Glen Miller playing softly in the background. Coffee tables were very popular in those days - often more substantial than the one shown at Summerlee and with sharp edges to catch your shin as you walked past... I was surprised however to see an electric fire instead of a coal fire. While these were indeed a popular alternative in those days (before central heating became the norm) I would have thought that the miners would have retained a coal fire! Summerlee has two working trams but just one tramline running from in front of the visitor centre to the old mine workings and then on to the miners' cottages. Tickets cost a £1 - one of the few chargeable items at Summerlee where, as in all museums in Scotland, entrance is free. 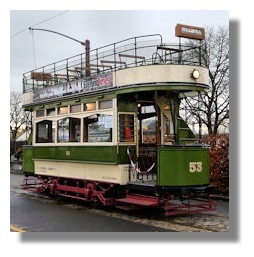 Those of us who remember the old tram cars had a nostalgic trip but it must seem like an old movie for the youngsters travelling on a "tram caur" for the first time. I took the trip on the single decker tram - it was about to depart as we arrived the tram stop, but the ticket collector opened the door for us. I remarked that it would have been more authentic of the old days of Glasgow Corporation tramways it had left without us... Being a single decker, it wasn't as "shooglie" as the trams I remember from my youth and we had mock leather seats instead of the wooden ones in this vintage tram. Passengers always faced to the front and when the tram reached the terminus the conductor went up the passageway, flipping the backs of the seats so that they faced the other way, which was neat! As always, I took far more photographs than I have space for in this article so there is a Window Media Video Slide Show . The slide ahow is also available on YouTube The presentation ends with a couple of video clips of the tramcar in operation. Summerlee Heritage Park also has its own Web Site. As I found when I got lost in Coatbridge trying to find Summerlee, you either need SatNav or a good map - such as the one provided by Google Maps.